Can you vote for the J only one I missed. Please vote for "D".. Thank you! Please please vote for F... T !! Thank you! il me manque la lettre V. Pouvez vous la remettre en téléchargement. Such a cute little piggy. Thank you. Please vote for "F".. Thank you! That is a cute alphabet. Thank you. Thanx so very much!!! Great alphabet! I'll be doing a towel for my bathroom with this N......thanks so much. What a fun alpha! Thank you. 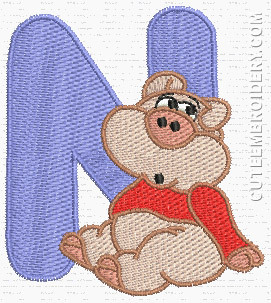 Nn nn nice Piggy, thank you. so cute these little piggies...thanks so much! Not sure how I missed the M!